This pilgrimage tour will take us to the foundation of our Church, to St. Peter's Basilica in Rome and the Audience with the Peter's successor, Pope Francis...to the first priest with stigmata St. Padre Pio in San Giovanni Rotondo...to one of the most powerful Eucharistic Miracle Sanctuaries in Lanciano from the 8th century....to the most lovable saint ever St. Francis of Assisi......and at the end to Medjugorje to pray with and to Virgin Mary, Gospa, Queen of Peace! This pilgrimage will show you how amazing and spiritually nourishing our Church is, diversity in every aspect, from Rome to Medjugorje, from St. Peter to St. Pio! Hear and learn about St. Francis, St, Claire, St. Padre Pio, St. Peter, St. Paul, St. John Paul II, Michael the Archangel, witness the Eucharistic Miracle in Lanciano, see the frescos in the basilica of St. Francis, say a prayer at the same hill Our Lady Queen of Peace says her prayers with the visionaries! Genuinely meaningful pilgrimage! Your pilgrimage starts with the overnight intercontinental flight to Italy, to Rome. Meals are served on board the plane. Arrival at the Rome airport, transfer before starts your Christian Tour of Rome this afternoon. First, on your schedule, today is the Holy Mass at St. Mary Major Basilica (or any other church we visit today). Then visit the Basilica of St. John Lateran, the Cathedral of Rome and was the Papal residence from the 5th Century until the papacy departed to Avignon in France. Across the street, we will visit the Holy Staircase (Scala Sancta) actual stairs that Jesus walked on the day he went to Pilate. Today on Sunday we will try to attend the Angelus with Pope Francis at St. Peter’s Square! We will end our day at our hotel with dinner and first night in Rome. Today we are up early for General Audience with Pope Francis at St. Peter's Square! After Audience on to the Vatican Museums for a visit! Here we will see art masterpieces of painters, sculptors of unknown masters but also of famous Michelangelo, Bernini...from antiquity to Renaissance... The tour will include walk-through Geographical maps Gallery until the Sistine Chapel with the magnificent fresco of The Last Judgment and many more halls and rooms filled with Christian art, history, and inheritance of all civilization. Today is also our visit to the heart of Vatican State, St. Peter's Basilica, and underground burial stones with the tomb of St. Peter, and Square dedicated to same Saint. After some free time in the late afternoon for shopping, we end our day at our hotel with dinner. Our entire morning will be inspirational and educational. 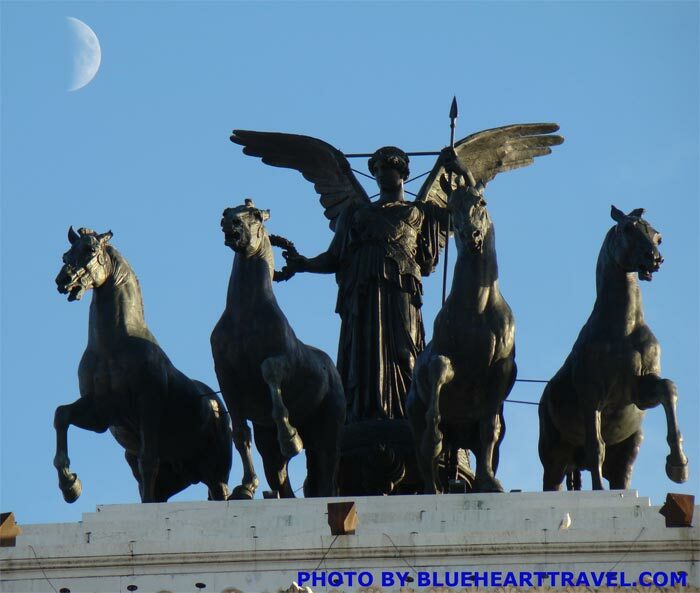 Today we will continue our tour by bus sightseeing of Rome and its sites like Piazza Venezia, with King Victor Emmanuel II Monument, passing by the Colosseum, Arch of Constantine, Imperial Forums (Caesar, Augustus, Trajan), Circus Maximus. As part of our today's tour, we will go to the Basilica St. Paul Outside the Walls, and our tour in Rome finishes with a visit to the Domitilla Catacombs. We will then leave Rome and will be on time for dinner in San Giovanni Rotondo. Hotel near the Shrine of Our Lady of Grace hosting the tomb of the St. Pio. 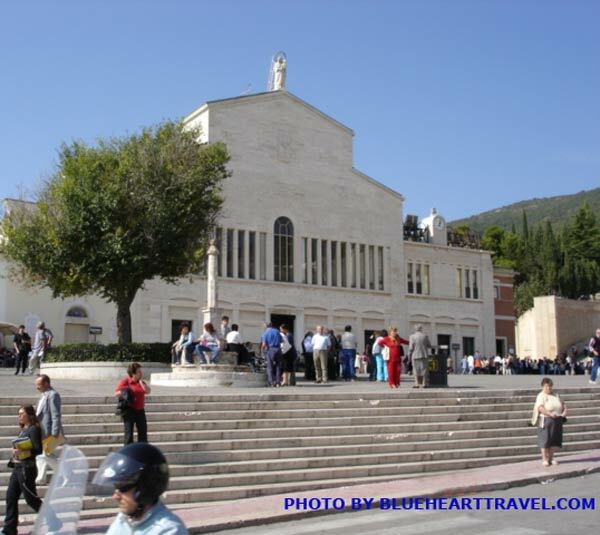 After Mass and sightseeing at the Shrine of St. Padre Pio, you are on your way to Monte Sant´ Angelo. Here we will visit the Grotto where Michael the Archangel had appeared on a few different occasions from the 5th to 17th century. This is an ancient pilgrimage destination visited by many, among them Bishop Karol Wojtyla; Padre Pio loved coming here…..After the visit and lunch break here we will return to the Our Lady of Grace - Sanctuary of St. Padre Pio, free time until dinner, our second overnight in SGR. After the breakfast, we will leave SGR and will be heading northwest along the "Autostrada Adriatica," our goal today is Assisi, but before Assisi short stop at Lanciano. The place of one of the greatest Eucharistic Miracles, in the 8th century during Holy Mass the wine turned into blood and the host into flesh. You will spend some time in the church where the relic is exposed and then continue to Assisi. Tonight we are at our hotel in Assisi. This early morning after a good night rest and breakfast we will have a sightseeing tour of Assisi, the city of Peace, St. Francis and St. Claire. Group will be learning about St. Francis and his life. Your walking guided tour will start at the church of Santa Chiara to see The Cross that spoke to St. Francis and pray his prayer before the same Crucifix. 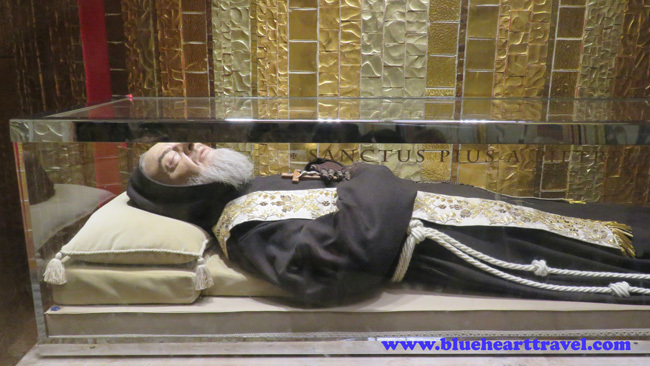 Group will learn more about St. Claire the founder of Poor Clair’s and see her incorrupt body. The visit will also include the crypt with the tomb of St. Francis, in the basilica dedicated to the saint. Our tour of the City of Peace will end with "Porziuncola" one of three restored churches of young Francis that nowadays is inside the Basilica of St. Mary of the Angels. After a guided tour of the City of Peace, you will have the entire afternoon for yourself, leisure time until dinner at our hotel! Second night in Assisi. After breakfast and Holy Mass, we are on our way to Rome airport. Same day later in the afternoon flight to Split or Dubrovnik in Croatia and transfer to Medjugorje. Dinner and overnight in Medjugorje near the St. James church and the Shrine of Our Lady Queen of Peace. On your first morning in Medjugorje after the breakfast, you will meet with your local English-speaking guide who will give you an introduction, a little walk from your hotel to the Church St. James just before English language mass at 10:00 am. You will have a chance to participate in many activities during your stay in Medjugorje. With thousands of pilgrims from all over the world, you will celebrate daily mass at St. James church. Visiting Bijakovici village, all six visionaries come from it; you will go up the Apparition Hill, Podbrdo place where Our Lady first appeared. The guide will schedule visits when possible to one or more visionaries, maybe Ivan, Marija, Vicka, Jakov or Mirjana. Each evening at 5:00 pm (at 6:00 pm during summer) you and thousands of other pilgrims will pray The Rosary. All three Mysteries are prayed during the evening program. In Our Lady’s messages, it was repeated many times how important is to come to mass where “we meet Jesus alive.” Messages of Prayer of the Rosary, Holy Mass, and Confession are the center of the evening program at St. James church. The apparition takes place at 5:40 pm or 6:40 daylight savings time. Pilgrims can attend after evening mass (in the Croatian language) on Thursdays and Saturdays Adoration of the Blessed Sacrament and Fridays Veneration of the Cross in the Church. After the Mass, there is the Blessing of the Sick and blessing of the religious items, souvenirs you have with you. Among other activities you will have a chance to climb the “Cross mountain”, Krizevac as local people know it, visit the “Blue Cross”, another place of the apparition of Our Lady. Each pilgrim will have time for private devotions, lunches, shopping, or simply enjoying your own “Freedom of the Prayer” with the Rosary in your hands! This morning after early breakfast group will leave for Split International Airport, flight back home, arrival same day. * 2 nights San Giovanni Rotondo - 4* Hotel "Gran Paradiso" or "Centro di Spiritualita Padre Pio"
For travel agents, church or prayer group or families - upon your request set your own date of travel - we will work hard until you are happy with the proposal!